1 Business Park Sofia Str. After setting its foot on the Bulgarian security service market nearly twenty years ago, the company has established itself as a trustworthy partner that supplies excellent quality secure solutions services. Customers include banks and insurance companies, industry as well as retail, public institutions or private households, who entrust their personal or their assets' security to the company. With a commitment to provide the best possible secure solutions, the company offers manned security, cash-in-transit, cash processing, technical security systems and security issues counseling service. As the top supplier of secure solutions, G4S Secure Solutions Bulgaria is able to provide its customers with a uniform, consistent service throughout the country. 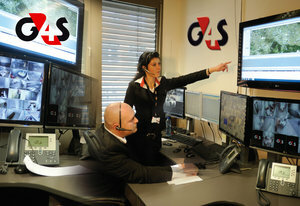 G4S operate in more than 125 countries and have more than 657,000 employees worldwide, which makes it the second largest private employer in the world. From risk assessment to delivery, the company works in partnership with governments, small businesses and large organizations to provide integrated solutions to security challenges.